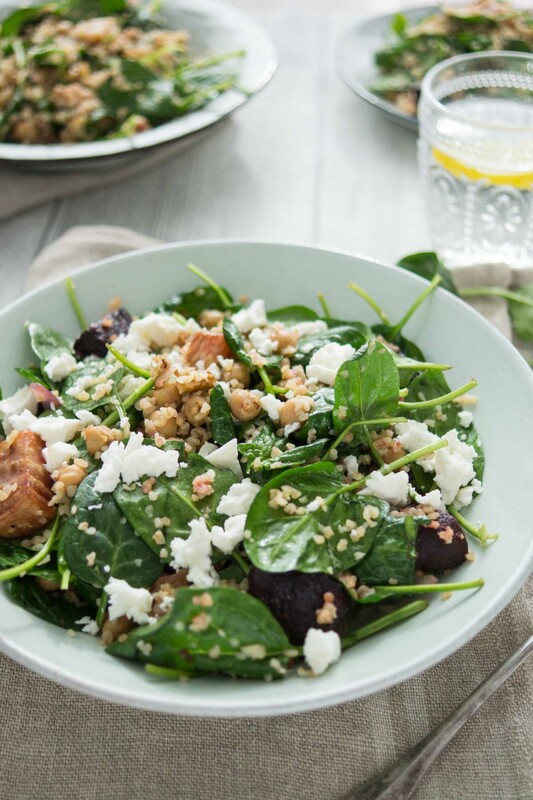 This power-packed spinach salad with roasted beets is chockfull of lots of good things! There’s cumin and coriander spiced chickpeas and red onion, whole grain bulgur, toasted walnuts, a little mint (a key addition that totally makes this salad!) plus original Greek feta. So tasty! And it provides enough fuel to be considered a main meal salad! Enjoy it warm or at room temperature, for lunch or for dinner. 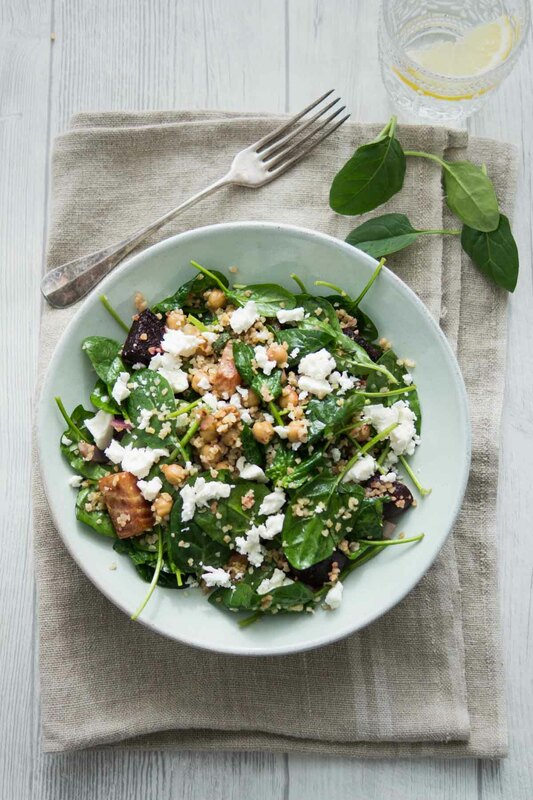 And guess what, there’s no garlic in this spinach salad, so you can enjoy leftovers as a take to work lunch. Haha, garlic. This reminds me when I was working in Munich and had a colleague of mine complain to my boss that she was suffering “migraines” because I smelled like garlic. She actually took sick leave. Seriously? I sat at least 6 meters from her and although I love everything garlic, I don’t eat every day… hmmm okay, maybe every second day. Nonetheless, this colleague returned to work and proceeded in a cinderella stepmother fashion, to tell me that it was forbidden to eat Italian food, marinated olives, sun-dried tomatoes (or the likes) and definitely not a salad with a French dressing. Sunday through Thursday. Period. Is this for real? Say hello to my new favorite garlic-free salad! The perfect thing to make this month which is full of bursts of sun and bursts of showers, where I really can’t decide whether I want to eat something warm or cold. Looking to save time? Well, the beets can be roasted ahead of time, or you can buy a package of precooked beets which would make this the perfect weeknight meal when you need something healthy and satisfying on the table fast! It also keeps well, which makes it ideal make ahead lunch. 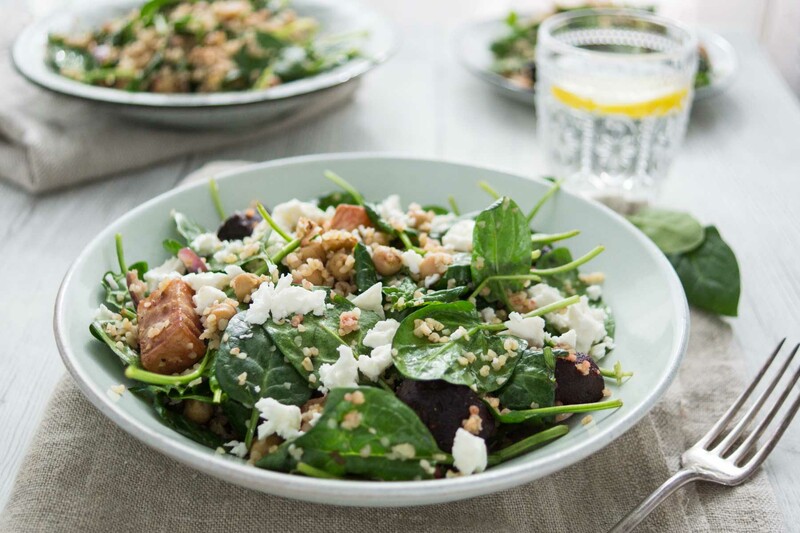 A delciious, healthy and easy spinach salad recipe with roasted beets, chickpeas, bulgur, walnuts, mint and feta. Even with roasting beets, it's ready in less than 45 minutes. For a quick-midweek meal either roast the beets ahead of time or use store-bought pre-cooked ones. Preheat oven to 400°F / 200°C and line a baking sheet with parchment paper. 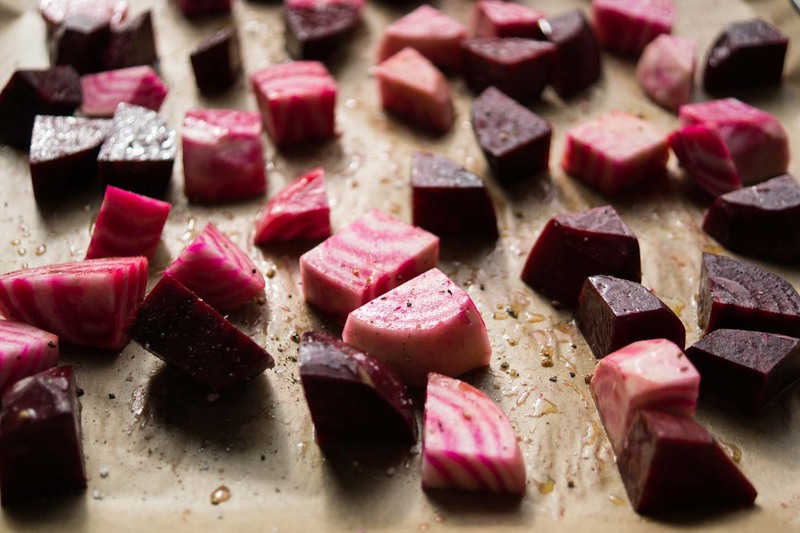 Toss the beets with a drizzle of olive oil, season with salt and pepper and spread evenly on the baking sheet. Transfer the beets to the preheated oven and bake for about 30 minutes, flipping the pieces halfway through, until the beets are tender (cooking time may vary slightly depending on the size of the beet pieces). Remove from oven and set aside. Meanwhile prepare the bulgur (according to package instructions). Cook in a 2:1 ratio water to bulgur. Bring it to a boil. Cover, reduce heat, and simmer for 10 minutes or until tender. Cover and set aside. Heat 1 tablespoon of the oil in a large non-stick skillet over medium heat. Add the onion, cook, stirring for 5 minutesor until tender. Add the cumin, coriander, and cook, stirring for 30 seconds. Add the chickpeas and roasted beetroot, and stir until chickpeas heated. Meanwhile, combine the bulgur, spinach, mint and walnuts in a large bowl. Drizzle with 1 tablespoon oil of the Crema di Balsamico and the remaining oil (2 tablespoons). Add the chickpea beet mixture and toss to coat. Serve into bowls and scatter with feta cheese. Drizzle with the remaining Crema di Balsamico and enjoy! Store-bought pre-cooked beets can also be used for this recipe if you are looking for a quick mid-week meal! 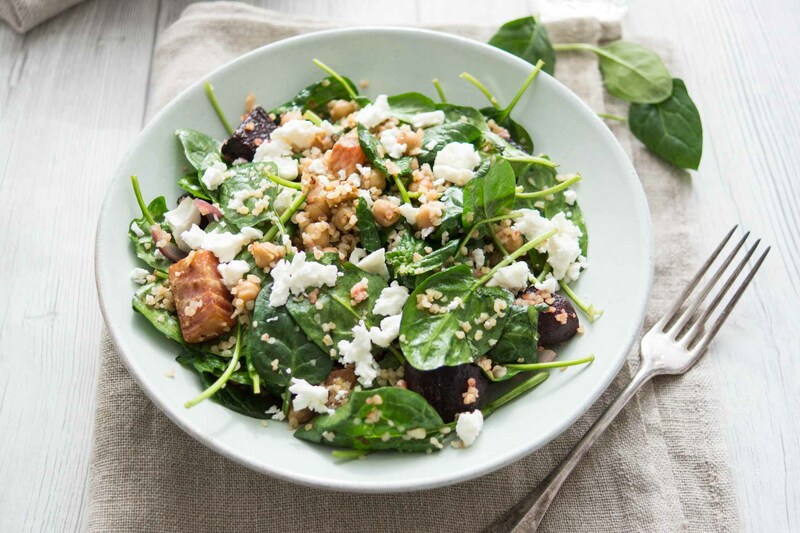 If you make this Spinach Salad with Roasted Beets, Chickpeas, Bulgur and Feta recipe, I’d love to hear how it turned out for you! Be sure to rate it and leave a comment below to let me know! Especially if you have tips for other readers. Or take a picture and tag me on Instagram @ellerepublic and don’t foget to hashtag #ellerepublic so I don’t miss it!